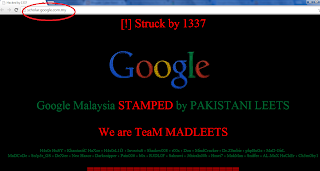 As yesterday big news that, a hacker name as "1337" from famous Pakistan hacking group "MadLeets" have hacked the Malaysian Google domain. As I have wrote that the hack was due of DNS poisoning method. Hackers have hacked the DNS system and changed the DNS of Google Malaysian domain to there own custom domain. But this is not the complete story. After hacking the main domain of Google Malaysian, same hacker "1337" with other Pakistani hacker from Mad Leets group have hacked almost all the sub-domains of the Google Malaysian. As like www.accounts.google.my, www.translate.google.my, www.translate.google.my and other domains. This hack was with the same as hackers have changed the DNS of the sites and make the users to redirect to there deface page. Below you can see some of the deface on sub-domains also. I have grab this last night only, at the time of writing all the domains are working fine, but I have managed to get all the mirror of the hack. You can check all the affected site also with the mirror here.